Vishnumaya, the annihilator of negativities, is the ultimate protector and destroyer of negativity. 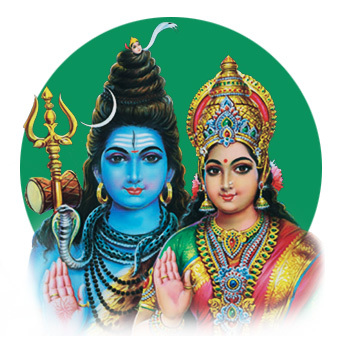 Born out of the spiritual union of Lord Shiva and Goddess Parvati with the help of Lord Vishnu, the merciful and wish-fulfilling archetype of Kerala can remove pain and suffering caused by casting of evil eye, curses, and doshas (afflictions). For the first time, AstroVed will be performing a grand fire prayer invoking the Archetype Vishnumaya, the protector of all and the grave enemy of negative forces, to help you overpower enemies and enjoy all-around success and progress in life. 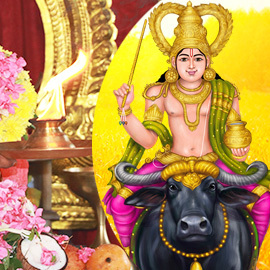 Vishnumaya is a popular deity in Kerala who is worshipped for the fulfillment of wishes, removal of negative/evil forces, success over enemies, and to gain overall prosperity. According to the Powerspot legend, Lord Shiva went hunting and fell in love with a tribal girl named Koolivaka and conveyed his wish to have her. Koolivaka, the daughter of tribal King and an ardent devotee of Goddess Parvati, prayed to the Goddess and sought her blessings to solve this problem. Goddess Parvati took the help of Lord Vishnu to disguise herself as Koolivaka and met Shiva as assured to the tribal girl. Out of this union, a child was born. Lord Shiva named him Vishnumaya as he was born out the Maya (illusion) created by Vishnu to disguise Parvati. He blessed him to be the protector of all, gave him a buffalo as his vehicle and ordered his Bhoota Gana (Army of Lord Shiva) to obey the orders of Vishnumaya. Goddess Parvati blessed him with two sticks named Kuruvadi, a mighty weapon which can help justice prevail and protect anyone in need. 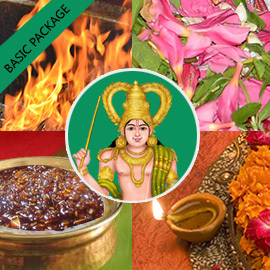 For the first time, AstroVed will be performing a grand fire prayer invoking the Archetype Vishnumaya, the protector of all and the grave enemy of negative forces, to help you overpower enemies and enjoy all-around success and progress in life. 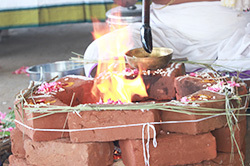 The Vishnumaya Homa is performed to invoke the energy of the archetype Vishnumaya, a solid shield of righteousness and the destroyer of negative forces, for your growth, success, and protection. Invoke the divine blessings of the wish-fulfilling Archetype Vishnumaya to diffuse negativity, restore success, and overpower enemies. Book your individual Vishnumaya Seva, a special Pooja to remove evil forces, at Kerala Powerspot. 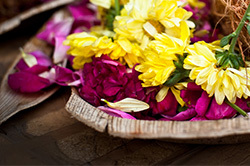 As per traditional practices, people of a special community called ‘Kuruppanmar’ will draw Kalam (pattern) of Goddess Bhadrakali, the fierce form of Shakti. Vishnumaya Services will then be performed by Kerala priests, which can remove negativity in life and fulfill your desires. 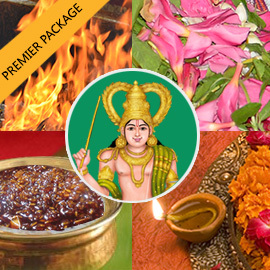 Book your individual Vishnumaya Homa (Fire Prayer Invoking Problem Solving & Protection Archetype Vishnumaya). 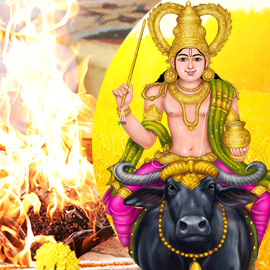 According to the Powerspot legend, performing sacred fire prayer to archetype Vishnumaya can fulfill all your wishes, destroy sorrows, eliminate negativity, and grant all-around success in life.